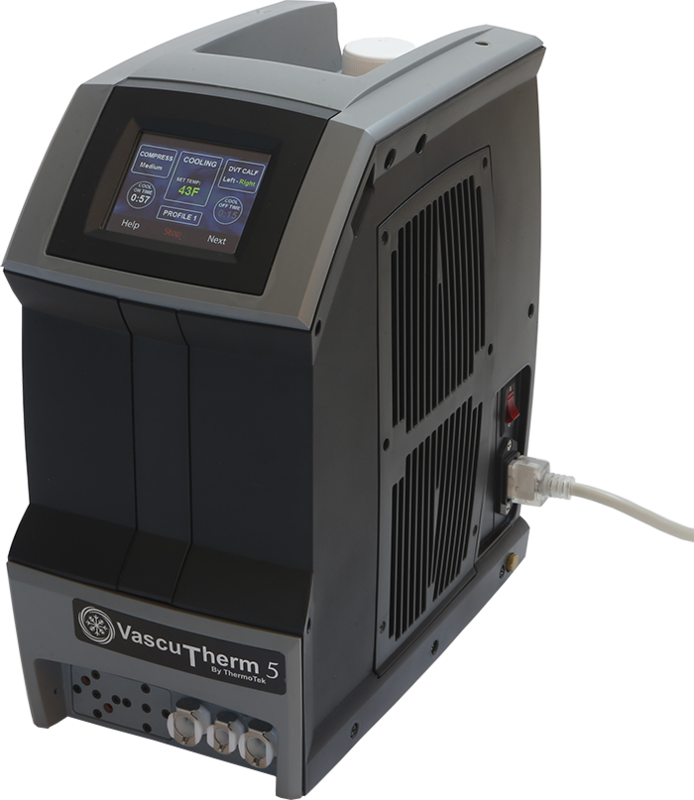 The VascuTherm 5 provides the total solution to DVT/VTE patient management. Completely redesigned with physician driven, customizable therapy profiles, the VascuTherm 5 offers the patient highly effective DVT prophylaxis with intermittent compression. ThermoTek manufacturers a variety of single-patient use therapy wraps exclusively for use with the VascuTherm therapy device. ThermoTek’s single patient use therapy wraps are latex-free and provide a precise, comfortable fit. INTENDED USE: Disposable therapy wraps are designed for single patient use only and may only be used on same patient for length of treatment. WARNING: DO NOT REUSE OR REPROCESS TO USE ON MORE THAN ONE PATIENT. Per FDA, 21 CFR Part 820, this product has not been validated for reprocessing or reuse. Fluid may freeze in the wrap if stored at 32ºF or lower and damage the wrap. Carefully read user instructions and warnings prior to operation. Therapy wraps are available in sterile and non-sterile; non-sterile therapy wraps should not be directly applied to an open wound. Do not use directly over breached skin. This product should not be used during the inflammatory phlebitis process or during episodes of pulmonary embolism, congestive heart failure, pulmonary edema, suspected deep vein thrombosis, acute inflammations of the veins (thrombophlebitis), decompensated cardiac insufficiency, arterial dysregulation, erysipelas, deep acute venal thrombosis (Phlebothrombosis), carcinoma and carcinoma metastasis in the affected extremity, decompensated hypertonia, acute inflammatory skin diseases, infection, venous or arterial occlusive disease or in any instances where increased venous and lymphatic return is undesirable. Use with caution on an extremity which is not sensitive to pain. Individuals with extremely low blood pressure should check with their doctor before using ThermoTek products. A licensed healthcare practitioner must select the correct temperature setting. Patients vary in sensitivity to cold. A regular check of the temperature must be made once it has been established for the patient. Caution should be taken during prolonged use, for children, diabetics, incapacitated patients, and those with decreased skin sensitivity or poor circulation. Due to individual differences in sensitivity and susceptibility to cold, patient’s skin should be frequently observed. Follow instructions of your physician for length, frequency and duration of treatment. These products are to be fitted initially by a healthcare professional that is familiar with the purpose for which they are used. The healthcare professional is responsible for providing wearing instructions and precautions to other healthcare professionals, care providers involved in the patient’s care, and the patient. If unusual swelling, skin discoloration or discomfort occurs, use should be discontinued and a healthcare professional consulted. A therapy wrap with therapy unit should be used in a medical facility or clinical environment with direct healthcare provider supervision. If the prescribing healthcare practitioner determines it is appropriate for a patient to use the therapy wrap at home, the healthcare practitioner must provide the patient with adequate and appropriate instructions for use of the device. Further, the healthcare practitioner must monitor the patient’s use of the device to assure appropriate use of the device and appropriate application of cold therapy. Cold therapy should not be used by patients with Raynaud’s Disease, poor peripheral circulation, diabetes, decreased skin sensitivity or hypersensitivity to cold. Do not attempt to sterilize a non-sterilized wrap or re-sterilize a sterilized wrap by any means. Do not use wraps near open flame. Do not smoke while therapy wraps are in use. Disposable therapy wraps are designed for single patient use only and may be used on the same patient for the length of the treatment. Do not wrap the therapy wrap so tightly as to restrict blood or fluid flow. Do not use pins to secure the therapy wrap or hoses. Do not allow the therapy wrap or hoses to contact sharp objects. Dressings used under the therapy wrap should be applied lightly. Wraps should not be left open (off of the patient) and inflated to a “balloon” or “ball” state for extended periods of time. Prolonged exposure to cold has a potential to cause injury to tissue. Please consult your medical practitioner for therapy setting, duration and frequency of treatment. Wrap, Knee, ROM Brace, XS, 13"
Wrap, Knee, ROM Brace, SM, 13"
Wrap, Knee, ROM Brace, M, 13"
Wrap, Knee, ROM Brace, L, 13"
Wrap, Knee, ROM Brace, XL, 13"
Wrap, Knee, ROM Brace, 2XL, 13"
Wrap, Knee, ROM Brace, 3XL, 13"
Wrap, Knee, ROM Brace, XS, 17"
Wrap, Knee, ROM Brace, SM, 17"
Wrap, Knee, ROM Brace, M, 17"
Wrap, Knee, ROM Brace, L, 17"
Wrap, Knee, ROM Brace, XL, 17"
Wrap, Knee, ROM Brace, 3XL, 17"
ThermoTek manufacturers a variety of accessory items exclusively for use with the VascuTherm therapy device. Cord, PW 10A/125 VAC, Hospital Grade, 12 ft.